13:30pm → 14:05pm A tour is offered on a reservation basis with 10 passengers or more in total. However, the tour is available for one passenger or more on Saturdays, Sundays, national holidays. ※A preschooler or younger can ride free, if he/she is accompanied by an adult. One preschooler rides free with one adult. Otherwise, a preschooler is charged a fee for a child. We offer a 6km boat ride from Benten Harbor to Tokimata Harbor in 35 minutes. The boatman takes you through the torrential stream in the valley of Garyukyo Prefectural Park with amazing maneuvering technique. Welcome to the refreshing boat ride that raises splashes of water and cheers every time the boat goes down rapids. Please enjoy thrilling and adventuresome scenes of Yunose Rapids and Minabara Rapids. ● We usually operate on a reservation basis. ※Except the winter season, individual passengers can join the tour without a reservation if there are seats available. There is a free shuttle bus service from the landing place (Tokimata Harbor) back to the departure place (Benten Harbor). It is about a 20-minute bus ride from Benten Harbor (departing place) to Tokimata Harbor (landing place). A parking fee is not necessary if the bus drops off passengers at Benten Harbor and proceeds to Tokimata Harbor to pick them up after the tour. ● If you have large luggage, we deliver it to the harbor for 100 yen a piece. ● Passengers with a disability certificate get 10% discount upon presentation of the certificate. ● In order to secure passenger safety, we may cancel rides without prior notice due to heavy rain, thunder storm, strong winds or the water level of the river. ● Please understand that we will not be responsible for the cost of transportation to the meeting place or accommodation even if your tour is cancelled. ● We offer a student group rate. Please contact us for details. We have rain covering on the boat for you to enjoy the ride even under the rainy sky. 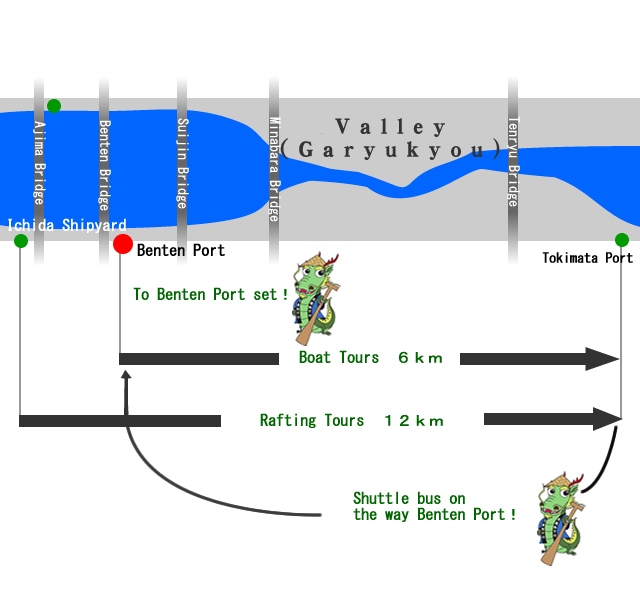 ●Please meet at Benten Harbor, where you will register and change clothes. ●	We will then drive you to the starting point, Kawasemi no Ie (House of Kingfisher) in Ichida, where you will have a lecture on safety and puddling practice. ●Rafting starts at Kawasemi no Ie, going under Ajima, Benten and Suijin bridges. From Minamihara Bridge, we will go down the valley of Garyukyo Prefectural Park, passing Tenryu Bridge, landing at Tokimata Harbor. ●You will be taken back to Benten Harbor. There you can take a shower, change clothes, and the tour is over! ●The tour is 12km long, and lasts 3 hours and 30 minutes including a safety talk. ●For elementary school children and older only. Elementary school children must be accompanied by their guardian. ●You are required to buy insurance for 500 yen. ●Minimum number of passengers is 2. ●It is also possible to postpone your tour if you wish. However, please understand that the cost of transportation to the meeting place and accommodation will be your responsibility. ●Rafting suits are available for free rental. ●At Benten Harbor, there is a locker room and shower room for both men and women. We are committed to thorough course confirmation and instructions by the boat administrator. After the river starts rising, our boatman confirms safety of the course of the tour himself. Since the passenger safety is our priority, the tour will be cancelled in the case of heavy rain, thunder storm, strong winds and change of water level. A rescue boat stands by at Benten Harbor and Tokimata Harbor all the time. We also conduct rescue drills twice a year, in the spring and fall. All boats have liability insurance coverage to prepare for emergencies and accidents. We have regular boatman trainings to develop steering technique of our boatmen. You are required to wear a life jacket (automatically inflatable survival equipment) on our tour. This cylinder-powered life jacket inflates automatically if the built-in sensor detects water, and ensures passenger safety. At Benten Harbor, there is a souvenir shop next to the waiting room. We carry wide variety of souvenirs from the Tenryu Boat Tour goods to local specialties from Southern Nagano. We accept MasterCard, VISA, and American Express cards. There are also several display corners. You will enjoy your waiting time before boarding! The souvenir shop is on this floor. Please wait until there is announcement. Please do not hold on to the railing until the boat leaves the shore. Do not stand up after the boat leaves. You can block water sprays by lifting the spray cover. Your life jacket automatically inflates when the sensor detects water. Please keep it on during your entire tour. Please be careful crossing the road on the bank. Iida is a very beautiful river. a lot of people coming. ther are a lot of high mountains. many bird. the beautiful river cool. I am very happy. there are many veautiful sights. there are a lot of bridges, ther are many big stones. many trees were freen. all employees are friendly. good natured. This is my first time a boat ride. Actually, I feltscared. But, afrer boat set sail the fear of veing lost. Scenery along the Tenryu river is very beautiful. Also the weather is sunny. Blue sky, clean riversm, many look more beautiful when the cherry blossomes had bloomed decorated the edges of the river. Unfortunately, the trip was so fost. This is a very pleasant experience. Tenryu Funakudari is a pleasant place for us to visit located in iida, Nagano. Up the wooden boat was the first experience for me. When down view of the river and then go to reach the boats really afraid, afraid of falling in the depths of the river. But when the boat began rowed, and we feed ther birds who followed us to the cliff rock with cherry trees. I feel the beauty of nature with avery fresh air. This is an intersting wzperience for me.